I’ve never been able to write in public places; I’ve always been too distracted. But lately I’m too distracted to write at home. The business side of writing (self-publishing) has been cluttering my mind and my dining room table. And I’ve really missed writing (my new WIP) while I’ve been attending to business. So three weeks ago I did something I’ve never been able to do before: I started writing in a public place, specifically a local coffee shop. I was pretty nervous because I’ve never been successful at it before—still, I was desperate because I’d been making such slow progress at home. The truth is, most days I wasn’t writing any fiction at all. I tend to be a creature of habit and a stickler for routine, so to ensure my success, I follow the same routine every day. I . . .
. . . Leave the house at the same time every morning—almost like I’m going to work. And it has to be early. The coffee shop fills up quickly! I try to be out the door by eight.
. . . Go to the same coffee shop every day. In fact, I try to sit at the same table (in a corner). That’s why I need to get there early—I think that table is a favorite of other coffee shop workers, too, so I need to beat them to it!
. . . Bring my headphones so I can listen to music—partly because I don’t necessarily like the background music, so I find it distracting, partly because I sometimes get distracted by conversations at neighboring tables and my music blocks those conversations out. I’m there to work, not gather dialogue!
. . . Bring everything I need for a morning of work: research, index cards, notes, pens, pencils, power cable for my laptop. It seems intuitive, but I have forgotten one or more of these items on any given day, and it’s made my work a lot more challenging, so I try to pack up carefully.
. . . Put aside my guilt about hogging one table all morning (this is a biggie). I try to tell myself that the coffee shop (and other patrons) are okay with it, but I’m not sure this is really the case. In any event, I’m doing this for a relatively short time, to achieve a specific goal, so I’m okay with doing it. I’m not sure if I’d be comfortable dominating this one table every morning indefinitely, but I’m okay for a couple more weeks. And the results? I’m happy to report my plan worked! My productivity soared, and I’m expecting to finish the first draft of my WIP by the end of this coming week . Once I start revisions, I’ll try working at home again. If that doesn’t work, then I may try another spot—maybe a new coffee shop? Or the public library? Maybe a different table in the same place? Now that I know I can handle public WIPping, the sky’s the limit! Do you ever work in public places? Are you able to concentrate? Do you have any tips to pass along? Do you ever feel guilty (like I do) about dominating a table? I tried once to write in a Panera. I did feel a little guilty that I was hogging a table but it was a small one and there were others there doing the same thing. I found myself looking up to observe my surroundings every ten minutes so I ended up leaving with nothing accomplished. Nice to hear your plan worked and were able to finish your first draft! Thanks for understanding — and I know what you mean about distractions! I knew I wasn’t the only person who felt guilty about table hogging!! Somedays I actually avoid eye contact with people when they come in, fearing they will give me dirty looks (understand, there have always been available tables, maybe just not the premium corner ones!). As for the end… almost, closing in on it, give me another week 😉 Thanks for your visit to my blog, Mel! I write both in a coffee shop and at home. It’s funny that I’m usually more productive at the coffee shop. At home, it’s too easy to procrastinate, especially if I get on a rough patch. Oh, I’ll find anything – vacuuming, laundry, dusting – to distract me from the task at hand. In the coffee shop, I have to focus on the blinking cursor. My friend Ken says that the worst thing to happen to coffee shops is when they got wi-fi. Now he brings a notepad and writes long hand! I used to think I needed quiet to write, that I couldn’t work with other people around. I found out otherwise when I had to spend five hours waiting for my car to be repaired. I took my laptop with me and got an amazing amount of work done even with the talk shows blaring on the TV in the service lounge. It turns out that household and garden chores can sometimes be more distracting than coffee house (or television) chatter. I still like to work at home because I’m more comfortable there, but I love the freedom of knowing that I really can write in a public place if I have to. You are on FIRE, Julia. I’m a bit jealous, as you seem to be among many writers who find coffee shops great places for serious work accomplishments/wordage. 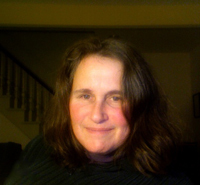 Me – not so much. For starters, as you know: there ARE no coffee shops,a and driving 45 miles to find one seems, well, counterproductive. And 2) I must have SILENCE to write. Even my OWN music is distracting. So here’s to YOU and finding what works best for you. I can’t wait to see your next spot and hear about the productivity you’ve managed to crank up. Keep up the GREAT work. Yes, not having a coffee shop would be a definite deterent to writing in one! 😉 As you say, driving 45 minutes would be counterproductive — as I said to Jackie, I feel that way about 20 minutes! It’s so strange that I used to need silence, too; I have no idea what changed or why!? Thanks for your kind words and encouragement about my productivity…here’s to cranking it up! Wow, sounds like we’re actually coffee shop twinsies, Jolina! (Except that I think my corner is very popular, hence the early arrival time…) Four hours is about my length of stay as well, and, yes, part of the reason is to give my behind a break. The chairs are NOT comfy in my corner, how about yours? Hmmm… wonder if that’s by design 🙂 Here’s to the coffee shop twinsies, may our productivity continue! I actually found it EASIER to write or work in a public place! I would get distracted at home with all the other things I could be doing or needs done! I find the coffee shops and the like conducive to working….and a LOT of people do it! Don’t feel guilty…..they want you there! I try to get out at least once or twice a week. I find a coffee shop or the library stimulating. I like the people watching and change in energy. I also appreciate being away from the to-dos of home and chores. Good for you for finding a creative solution to write! Oh and “claiming” a table is just coffee shop culture. You’re fine. How lovely to hear of your writing experiment and that it’s going so well, Julia. Bravo to you for overcoming your initial reservations. I love writing in public places, but go at it in a different way. I take notebook and pen and I write about what I see and make notes and ideas for character studies, or write poetry – especially on trains. I’m a very random writer, I suppose, and I weave ideas into current manuscripts or use them for new ones. My focus is completely gone when I am out and about, so I follow the muse and see what happens! Loads of luck with finishing the WIP soon! Another train vote — I love it!! And I know what you mean about the writing in public places being a great place for character studies. On days I’m not flat out crazy-woman about writing, I love doing that, too. Lately, though I seem to have a one track mind. It’s a bit unlike me, but I’m seizing the day! I absolutely love the “random writer” idea, however, and I may need to try that! Very cool! I wrote a lot of my first novel in a coffee shop, where I people-watched and got inspired on a regular basis. It really is nice to get out of the house to write. Change of venue = change of perspective, which is always good for writing. So glad your née routine is working! Change of venue DOES equal change of perspective, and I don’t know why I never figured that out before now?! I also think that because I’m an introvert I try to avoid eye contact, I’ve found, which really helps me focus just on the job at hand. Here’s to new routines! I’m saving for a laptop to TRY the adventures of writing in public. With summer around the corner, and a beautiful place filled with wild mustangs just a few miles away….a coffee shop, eight parks, and plenty of space on the tailgate of my truck…the options are endless. And maybe I’ll quit worrying about the dishes, laundry, floors, etc…. Well, I must admit, I have NO mustangs nearby, which I would find endlessly inspirational, I’m sure, as I love horses. WOW, the options sound not just endless but amazing. As for worrying about dishes, laundry, floors, etc.? I gave that up a LONG time ago 🙂 Here’s to a new laptop in your future to aid your adventures w/ public writing! Oh man . . . I buy ONE cup of coffee (small) and get a refill (FREE) in the 3 or 4 hours I stay. STILL, I will not feel guilty after today when others (a) stayed much longer, and (b) rudely and loudly talk on their cell phones. I’m always a good coffee shop neighbor; hmm, I feel a new blog coming on! 🙂 p.s. yes, I’ll take your advice to stick to the stride ’til it wears out, good advice, thanks! This made me laugh, “dominating this one table.” You are my hero once again. How awesome that you are getting some quality work done. I’ve gone to our public library before and honestly — it was LOUD. I needed headphones. People talking, people with sniffling noses and coughs. (That’s what made the the craziest) and then I felt guilty for getting perturbed at poor sick people. We have a new library now– it’s been about two years since I’ve tried it I was so scarred last time. Maybe I should give it another go. And NOT access the internet either. OK, so I’m super weird about this. I do the bulk of my writing at home, but sometimes I get stuck and I need a change of scenery. I started going to the local coffee shop, but it was too distracting. I can’t listen to music when I write because it distracts me to (UGH). So the coffee shop wasn’t too loud, it was too quiet! Weird, right? I could hear phone conversations and people slurping coffee and I couldn’t focus. So then I tried Panera and it was a bit better. There’s enough clatter going on around me that I can zone out the conversations and slurping, but I felt guilty hogging a table all day and there are a lot of people who treat it like their own office with loud phone calls and such. So now, I go to the local McDonald’s. It’s like my own private office. I can get so much done there. They sell a ton of food, so I don’t feel bad hogging a table, because no one can keep track of the lady in the corner. I am the only one who sets up camp, so annoying business-types aren’t hanging around. There is free wifi and free refills on my drinks. And the clattery background noise to dull everything else. Plus, there are amazing convos there. I hear the best stories when I’m in McD. It gives me fodder for days. Great piece, great timing, Julia. I find myself in the unexpected position of having three books releasing this year — and can’t write a word! I’ve been so overwhelmed and distracted by the publicity/promotion work that I feel as though I’m never going to be able to access that inner voice again. But the idea of splitting the work by splitting the locations — coffee shop for real writing; home for all the rest — makes a huge kind of sense. Thanks for planting the seed. Maybe I’ll even be able to rediscover what this was all about to begin with: the pleasure of writing. Three books!! That’s awesome, congratulations, Kim! I hope this works for you, like it did for me — I’m rooting for you! Let me know how it works. It really, really helped get back to the “pleasure of writing,” great way to put it! Today, as I close in on “THE END” (about another week), I’m enjoying every single second of the thrill of the WIP! YOU CAN DO IT! Thanks for your visit to my blog, and for your comment, nice to meet you! Sorry, just took a short break to play some Scott Joplin. Now what were we discussing? I have a favorite coffee shop I visit regularly. I follow most of the routine you do, buying a drink, putting in my earbuds, and working as hard and fast as I can. I thank the staff, buy something else, and take off. They like me because I buy food every time I come and I usually bring other author friends in with me. “Working as hard and fast as I can.” << EXACTLY! It's a word storm when I sit there, Nancy -- 6K words yesterday. 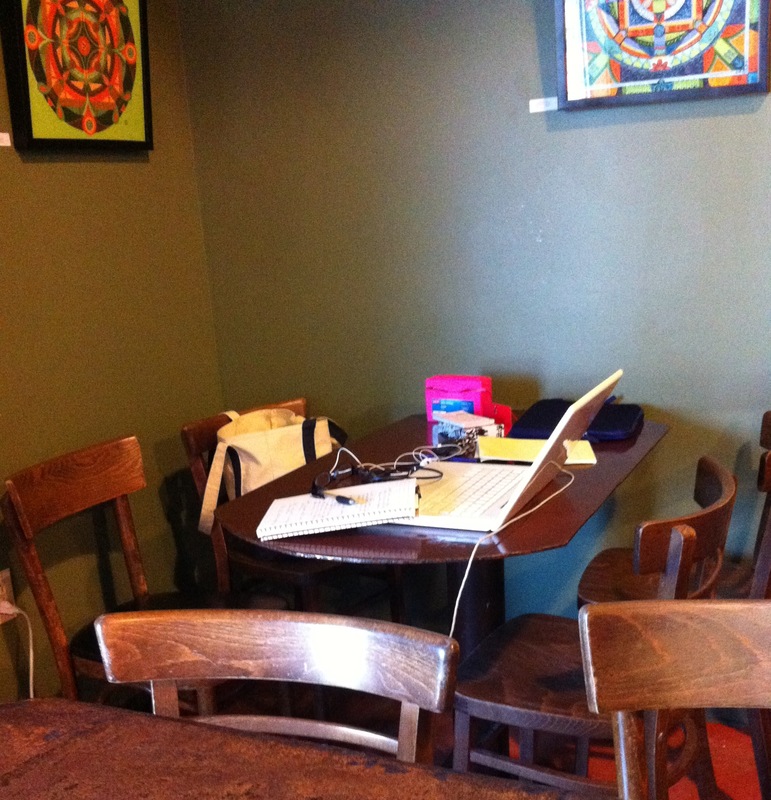 It was the biggest rush, and I'm packing up as I write, to hit the coffee shop corner table. Here's to another wonderful writing day, my friend! And maybe I'll even throw in a bagel today! Great tip! I haven’t done much writing outside, but you make it sound enticing. I’d have to take a box full of files with me, though. Glad you’re having good success. Writing in public can be fun — I’m here to say — as for your box of files… if it makes you feel any better, I DO take a very large bag with a lot of stuff in it, just in case! It depends where I’m up to, Julia. At the notes and pondering stage of any book/chapter, I go to a beach which has a sprawling cafe, wrap up warm and sit outside – then I have the great sea air, peace and quiet and abs no guilt about hogging the table. When I’m writing the first draft, I need to be at home in my study, then I’ll take the MS back to the beach to review and ponder before the second draft. I generally find town cafes unconducive because I can’t stand background music of any kind – it distracts my mind. Nice post – lovely comments! The beach!! That sounds absolutely lovely . . . and I love the thought of pondering the manuscript on the beach, I may have to try that once it warms up here! I know what you mean about background music — it can be very distracting — which is why I listen to music of my own choosing. Otherwise I can’t get anything done either! Glad you enjoyed, Jenny! I think I do better in coffee shops than places that are too quiet! Boy, do I know the distractions of people watching and wondering, Aisha! I have to say that with this project, it’s the very first time I’ve been able to NOT notice anyone, not care if I notice anyone. It’s the weirdest thing, though, now that I’ve finished the first draft, I am back to being distracted again!! I think it may be that I was so totally consumed with fast and furious writing? Thanks for the encouragement, and here’s to the thrill of the word 🙂 p.s. I wouldn’t call writing a blog getting nothing done… I seem to be neglecting mine way too much, gulp! That said, I’m super jealous of anyone who can write with music in their ears. An ipod with a preferred songlist would be a great way to block out unwanted noise. Do you find that your music influences your writing in any way? “that portal into THE ZONE” << exactly, Barb! And I can't explain why, but for this book, in this time, that portal was that particular coffee shop! Funny that now that I'm done with the first draft, I need to work at home again! (Of course I do read outloud, haha) I'm so glad you asked about music -- I always have a soundtrack for my books -- and this one was no different. I am embarrassed to tell you how many times I listened to one particular song (had it on endless looping and it became background so that I could just listen and enter the zone), but I'll tell you what it was/is: It Will Rain (Bruno Mars).